Hearts fail. In her research lab, Sarah Franklin endeavors to find out why—and how to protect them. 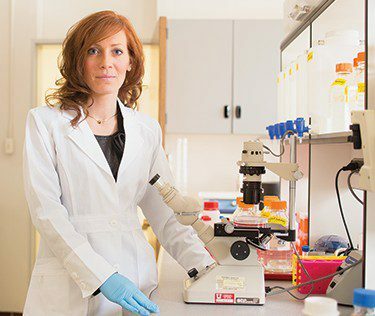 Sarah Marsing Franklin (BS ’03, PhD ’06) goes straight to the heart of the matter in her profession—all the way to the genetic level. Franklin researches hearts as an assistant professor of internal medicine at the University of Utah and studies how a heart transitions from healthy to failing. “If we can understand which processes are good and which are bad, then we could potentially develop therapies and drugs to benefit people who are undergoing heart failure,” she says. Franklin experiments with isolated live cells and animal models at the Nora Eccles Harrison Cardiovascular Research and Training Institute (CVRTI). She also manages a research lab with four employees. “We study which proteins in the nucleus bind to DNA and regulate gene expression in the heart and how these proteins can exacerbate heart failure or protect the heart from failing,” says Franklin. Franklin’s fascination with genetics began early. While in high school at age 16 she took classes at the College of Eastern Utah, where she volunteered as a chemistry teaching assistant. She earned an associate degree a week before her high school graduation, received her PhD from BYU at age 24, and became a postdoctoral fellow at UCLA in 2007 when she was 25. She retains an adjunct assistant professor position in UCLA’s Department of Anesthesiology, where she was honored with the Chancellor’s Award for Postdoctoral Research in 2011.